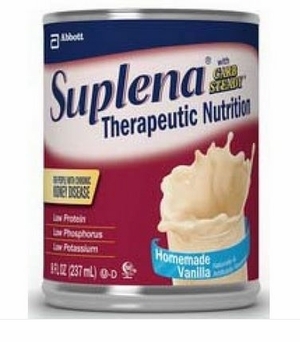 Suplena with Carb Steady is a therapeutic nutrition supplement that is specifically designed for those with chronic kidney disease (stages 3 & 4). Suplena Drink can help people with this disease maintain their nutritional status while adhering to their renal diets. The Carb Steady is a carbohydrate blend designed to help manage blood glucose response. Suplena is high in calories, low in protein, phosphorous, potassium and sodium, and it is a good source of fiber. Kosher, Halal, gluten-free, low-residue, and suitable for lactose intolerance. Can be used as a supplement or sole-source nutrition. Homemade Vanilla flavor. :: Ingredients: Water, Corn Maltodextrin, High Oleic Safflower Oil, Milk Protein Isolate, Isomaltulose, Sugar (Sucrose), Canola Oil, Sodium Caseinate, Glycerine, Short-Chain Fructooligosaccharides. Less than 1.0% of the Following: Soy Lecithin, Natural & Artificial Flavor, Potassium Citrate, Sodium Citrate, Magnesium Chloride, Choline Chloride, Magnesium Phosphate, Calcium Carbonate, Ascorbic Acid, L-Carnitine, Calcium Phosphate, Carrageenan, Potassium Chloride, Taurine, Salt (Sodium Chloride), Zinc Sulfate, d-Alpha-Tocopheryl Acetate, Ferrous Sulfate, Niacinamide, Calcium Pantothenate, Pyridoxine Hydrochloride, Manganese Sulfate, Cupric Sulfate, Thiamine Chloride Hydrochloride, Riboflavin, Vitamin A Palmitate, Folic Acid, Chromium Chloride, Biotin, Sodium Molybdate, Potassium Iodide, Sodium Selenate, Phylloquinone, Cyanocobalamin, and Vitamin D3.